Many Wilmingtonians remember the leafy live oak tree located in the 4200 block of Market Street near Kerr Avenue. Affectionately dubbed the “Sonic Oak,” the tree’s limbs draped over the bustling thoroughfare and restaurant drive-in sign. Likely more than 100 years old and approximately 50 feet high, the Wilmington Tree Commission named it a Heritage Tree in 2012. Despite protests, the live oak was removed in March 2015 to prepare for a N.C. Department of Transportation project to widen Kerr Avenue. City and DOT official considered relocating the tree, but the project was cost prohibitive. Marcia Doering, former chair of the Wilmington Tree Commission (WTC), and current chair of the North Carolina Urban Forest Council, approached Cape Fear Museum to see if we would be interested in saving a tree slice or “cookie” from the trunk of the tree. Museum Exhibit Designer John Timmerman and Bill Jayne, the current chair of the WTC, met with Robert Ayers, the contractor hired to remove the tree. Robert agreed to donate his services and the tree cookies to the Museum. Smaller parts of the tree had already been removed, but he didn’t have a chainsaw large enough to cut the tree to create a slice. Once the chainsaw was acquired, the oak was completely cut down. Robert moved the tree stumps to a wood yard in Rocky Point. After viewing the pieces, John and Bill soon realized the Museum van wasn’t large enough to transport the trunk. 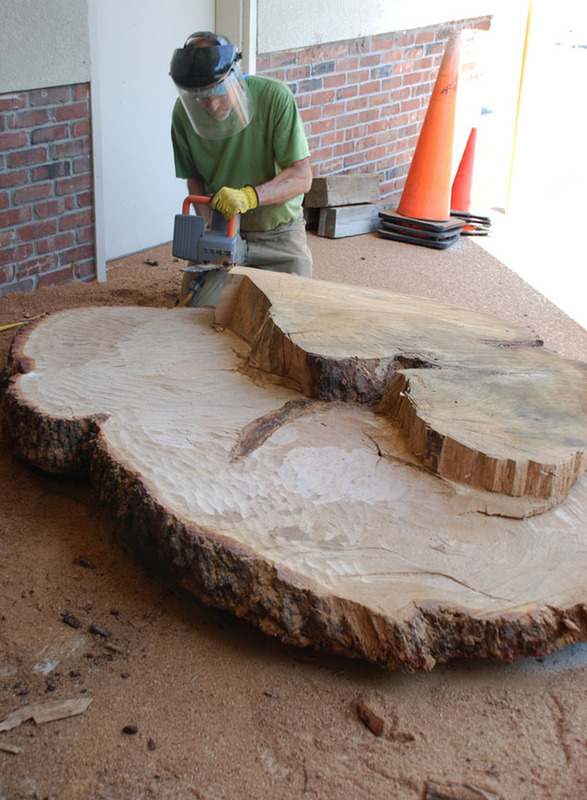 After the oak pieces were delivered, John spent three days during some of the hottest temperatures this past June trimming the large trunk down to a thinner slice. The finished product is a slice approximately 5.5 by 7.5 feet weighing about 700 pounds. Getting the slice in the building was another challenge. City of Wilmington arborist Aaron Reese arranged for a heavy duty forklift to move it inside. The cookie is so large it barely fit through the loading dock door. It is now slowly curing inside the museum for the next six months to prevent fractures and will be safely stored. Several cookies, up to two feet wide, will be used as stepping stones in the New Hanover County Cape Fear Museum Park, leading visitors from one activity station to the next. Cape Fear Museum is pleased to partner with other organizations to help preserve a piece of this well-loved tree for future generations to enjoy.